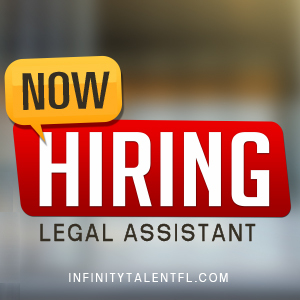 Tampa office of a national law firm is in immediate need of a Litigation Legal Assistant/Paralegal (Hybrid) with first-party property and bad faith insurance claims experience. The ideal candidate will have 5+ years of litigation experience, have experience and knowledge of State and Federal Courts, be organized and efficient, able to multi-task efficiently, experienced in drafting correspondence, pleadings, discovery, Complaints and generic motions, calendaring, good time and effective case management skills, E-Filing and handle the administrative aspects of the practice. ABSOLUTELY MUST have the drive, take initiative, be self-sufficient and a proactive team player. The firm offers a competitive salary and an excellent benefits package. Salary DOE.